Mary Wright, formerly Mary Slattery, was born in Abbey, Co Galway. Her parents were Bridget Hutchinson and Michael Slattery. 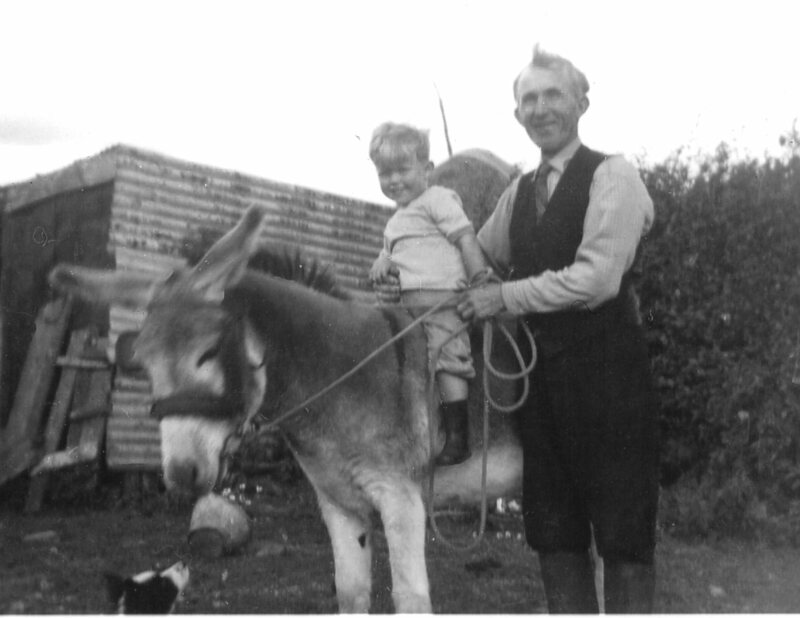 Michael came from Lissinard, Tynagh and the family lived in the Hutchinson family home in Abbeyville, later moving to Abbey Village. Mary had four siblings – John, Bridie, Michael, and Josie. 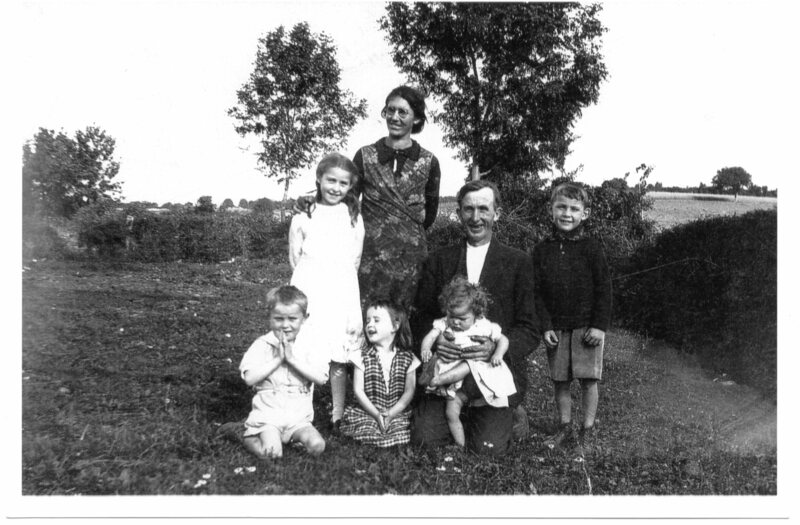 Mary Slattery with her parents Bridget (standing) and Michael (kneeling) and her four siblings – John standing and in front Michael, Bridie and Josie. 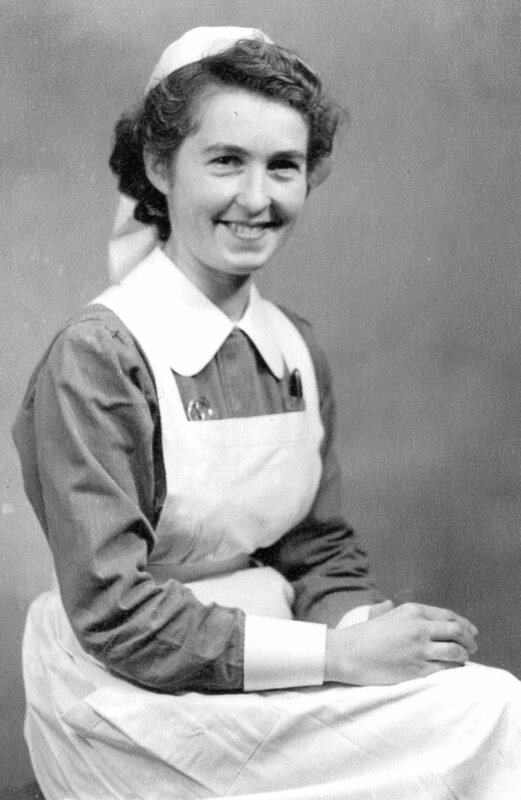 Mary Slattery applied for nursing for the yet to be formed NHS in the UK. After passing the initial tests she was accepted for nursing training at Addenbrooks, Cambridge for the 3 year training course to achieve her SRN qualification. Her final examination was on 22 March 1951 and Mary became an SRN the following month. Mary married Alan Wright in June 1950 and they lived in Ridge Road, Kempston, Bedford for the whole of their lives. 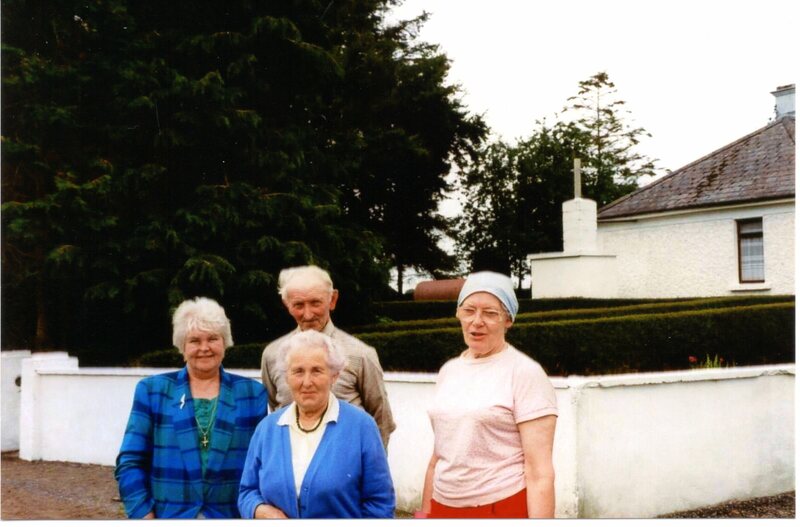 Mary kept close links with Ireland and was also happy to entertain any Irish connections visiting the UK and these included many visiting priests and other relatives from Ireland. Mary never forgot her roots and continued to visit Abbey frequently, bringing her own family to see their grandparents. 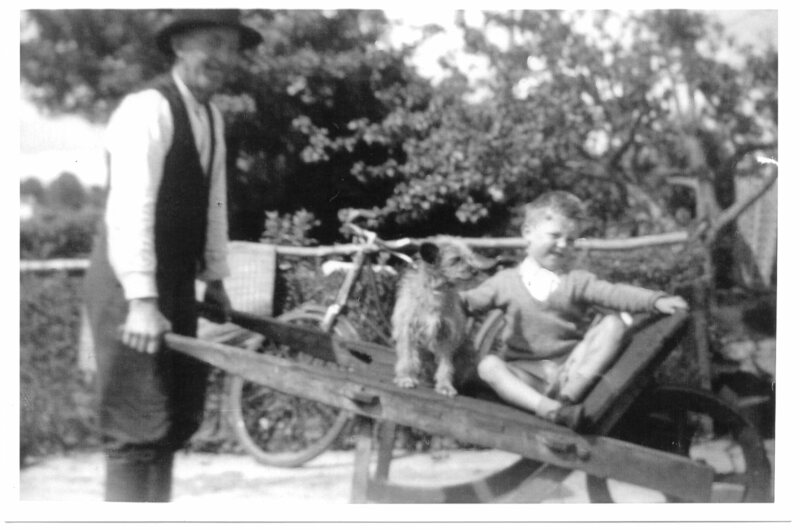 Mary’s father, Mick Slattery wheeling his grandchild Michael Wright and the family dog in his wheelbarrow. 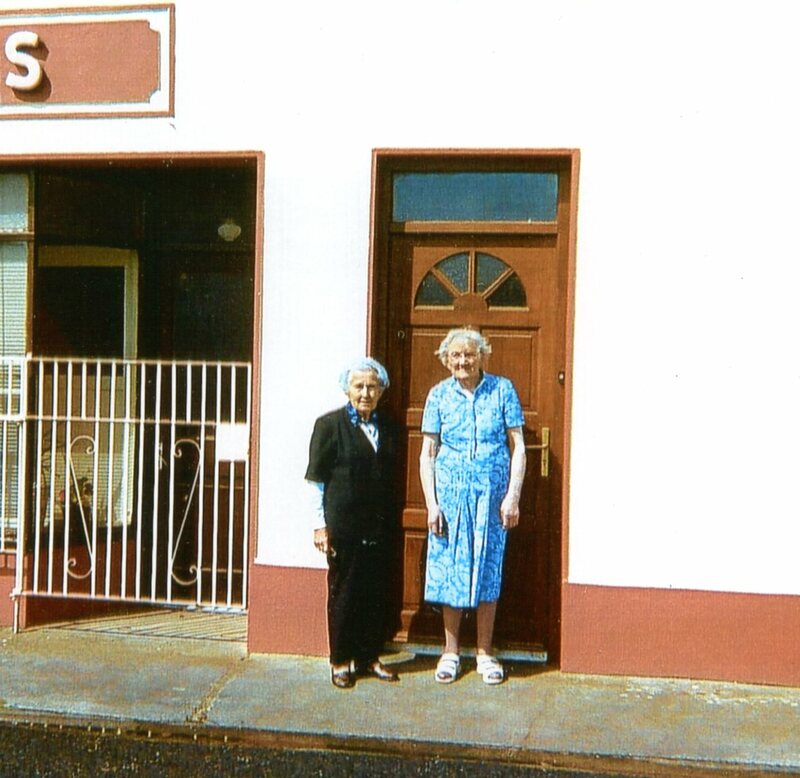 Over the years, Mary kept very much in touch with Abbey and in particular with Mrs Nora Hynes who was a close friend all through the years. From left: Nora Hynes, Joan Comer, Mary Slattery Wright, Maureen Danforth, Michael Wright. 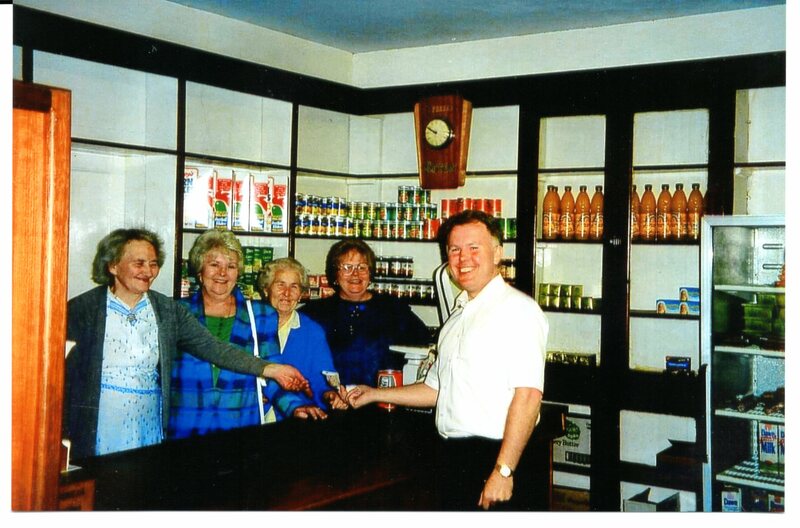 Photo courtesy Joanie Durgin, taken in Hynes’ Post Office in 1994. Mary’s son Michael Wright continues to visit Abbey where his mother and ancestors are buried. All of the photographs in this article, remembering the Slattery and Hutchinson families, are courtesy of Michael Wright unless otherwise credited. 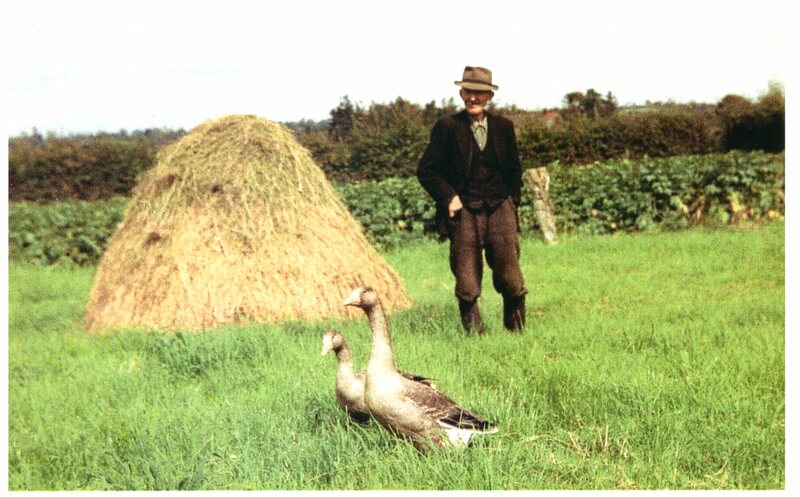 Mary’s father, Mick Slattery, surveying the scene and his pet geese!! 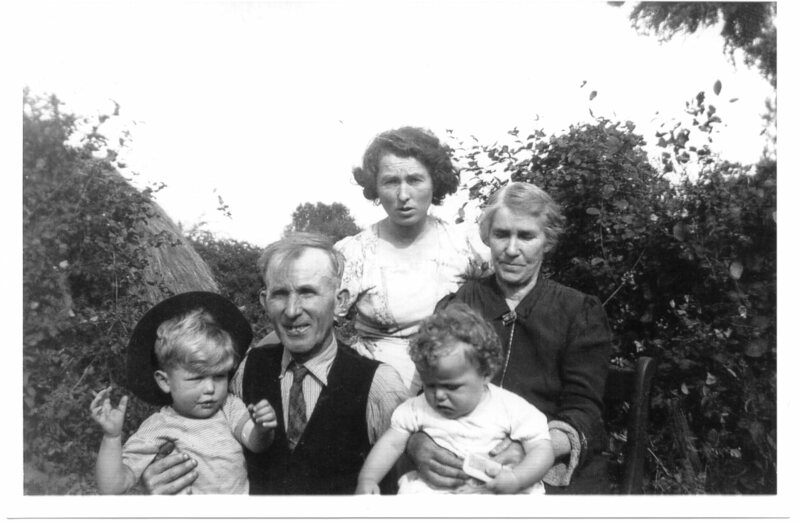 Mary Slattery standing at back with her parents Mick and Bridget and two grandchildren. 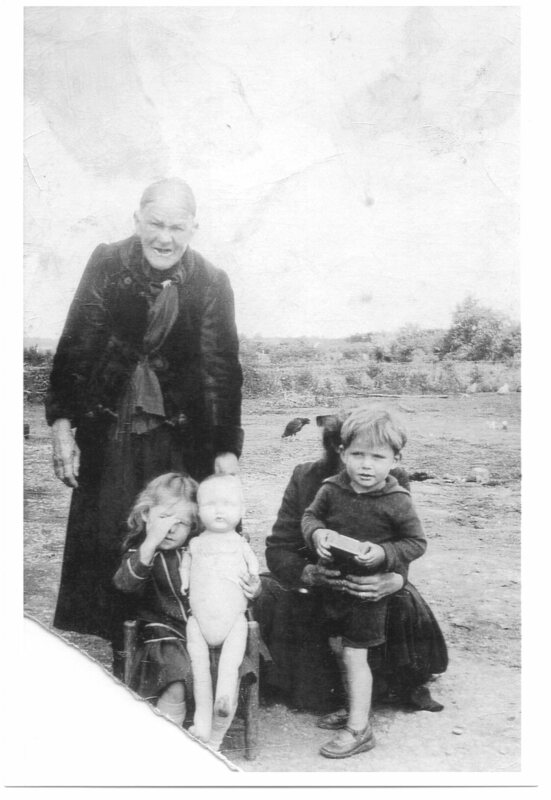 This picture shows Grandma Hutchinson, Mary’s grandmother, standing behind Mary’s sister, Bridie, (holding the doll) and Mary’s mother crouched down behind Mary’s brother, Michael. Mary’s mother, Bridget Hutchinson had six siblings and two of them Michael and Patrick emigrated to Boston in the USA. 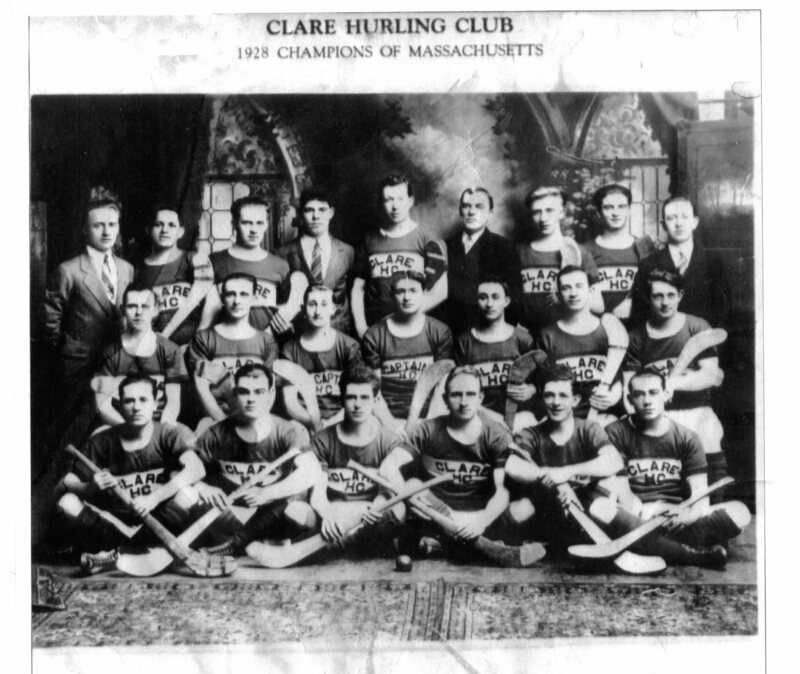 There they played with the Clare team and the photograph below shows them in the front row. Prior to their emigration they had played with Duniry hurling team. Back Row: N S Turner, President; J Concannon, Manager; J A Turner; M Wren; M Howard; M Vaughan, Treasurer; C V Turner; M F Naughton; T J Hurley, Secretary. Middle Row: J Brown; A Maloney; P Keffe, Vice Captain; P Rielly, Captain; P Loughman; P J Naughton; T Gough; Front Row: J B McAllister; B Murray; P J Hutchinson; J F Turner; M Hutchinson; M T Joyce. 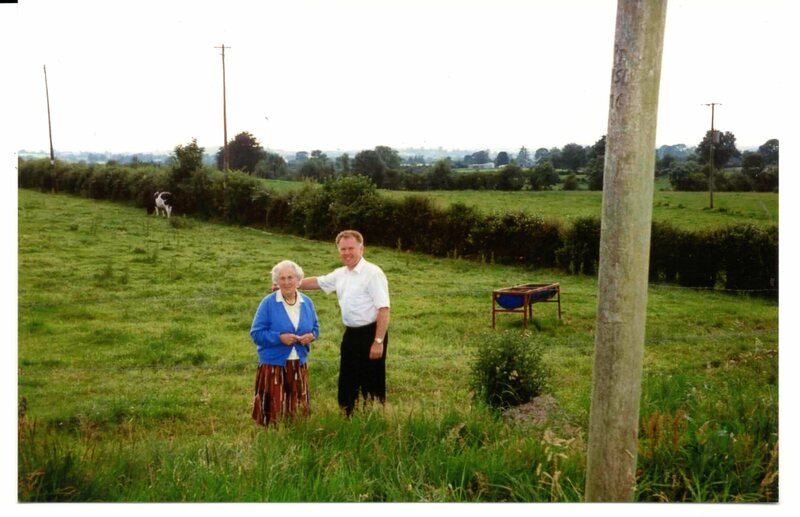 Mary Wright’s parents, Bridget and Michael Slattery are buried in Abbey graveyard and Mary travelled from England on a regular basis to visit their grave. 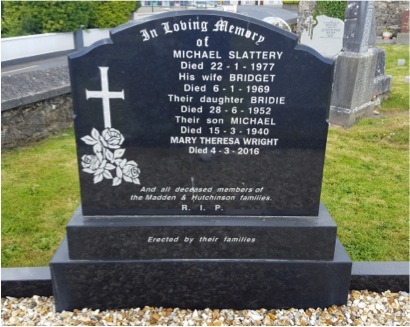 Two of Mary’s four siblings are also buried in Abbey cemetery – Michael who died in 1940 and his sister Bridie who died in 1952. 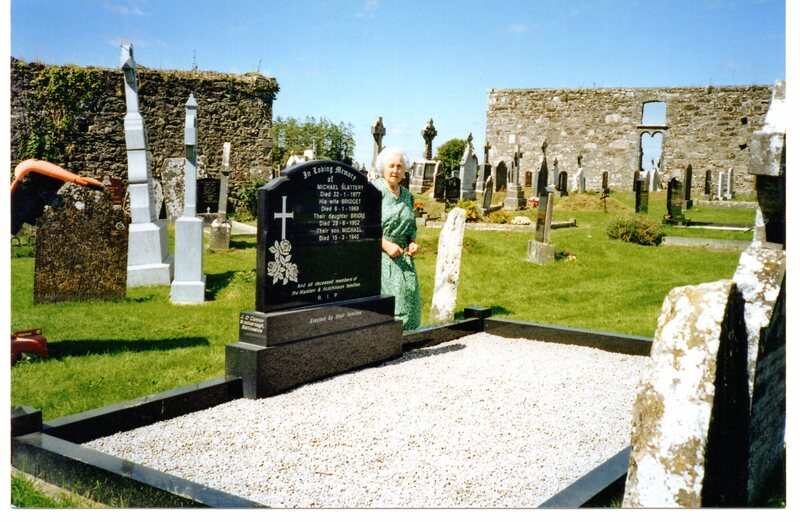 Mary herself always expressed a wish to be buried in Abbey Cemetery and when she died in 2016 her wish was granted.